Local composer Callum Watson has been selected to take part in the 25th International Young Composers Meeting in the Netherlands early next year. The meeting invites 16 of the best young composers from around the world to collaborate on experimental new musical works for Orkest De Ereprijs - a leading orchestra in the Netherlands. “I am humbled to have been given this amazing opportunity” says Callum. “Europe has such a thriving new music culture in addition to its long history of master composers from Beethoven to Bach. This opportunity can only influence my practice for the better”. There will be further opportunities for the 16 international composers with the program offering a number of large orchestral composition commissions to participants following the meeting. 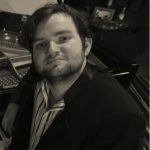 This opportunity follows a big year for Callum gaining acclaim for a 5 star recital series in North Melbourne, producing an ambitious chamber music CD called Echoes Of Earth recorded in one of Melbourne’s biggest Cathedrals and performing solo shows at the Melbourne International Jazz Festival.